TALLADEGA, Ala. – Two drivers who were among the NASCAR Sprint Cup Series season’s most productive winners won’t be in the race for the championship. Former champion Brad Keselowski and Martin Truex Jr., winners of four races apiece this year, fell out of Sunday’s Hellman’s 500 at Talladega Superspeedway with blown engines and failed to qualify for the Round of 8 with four races remaining on the schedule. Also knocked out of the championship group Sunday were Austin Dillon and rookie Chase Elliott. The Chase will continue next weekend at Martinsville Speedway in Virginia. Keselowski was racing in the lead group with 44 laps to go Sunday when the engine in his Ford expired. He was in the lead when paper became trapped on his grille, forcing him to give up first place to Ryan Blaney in an effort to control water temperature in his car. The engine blew a lap after he dropped to second. 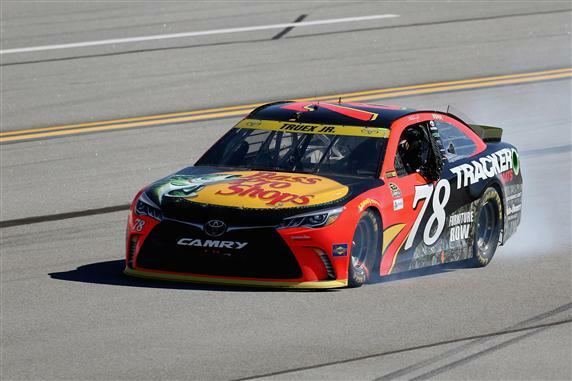 A sour engine 41 laps into the race was the gremlin that wrote an end to the championship hopes of Martin Truex Jr. and the Furniture Row Racing team. Truex entered the race in the middle of the Chase group but saw his run toward the Homestead finale fizzle in a plume of smoke. The DNF was only the second of the season for Truex, who won the pole for Sunday’s race. “To barely make it to the first pit stop hurts,” said Truex, a Championship 4 driver last season. “It’s the way it goes some days. Some things you just can’t explain. Dillon’s failure to advance to the Round of 8 perhaps was the toughest to swallow. He finished in a tie for the eighth and final spot but lost it to Denny Hamlin via tiebreaker. Hamlin’s narrow third-place finish Sunday was higher than Dillon’s best finish (sixth) in the second round. Elliott, who needed a win Sunday to advance in the Chase, led nine laps, but his Chevrolet wasn’t as strong over the second half of the race. He finished 12th.